The Addison Fire Protection District has used a key box program for commercial and industrial properties with a great deal of success for decades. In 2010, we extended this program to residential properties in our response area on a voluntary basis. This program has had great success in providing nondestructive quick access to residences in the time of an emergency when a resident in unable to open the door for the firefighter/paramedics. 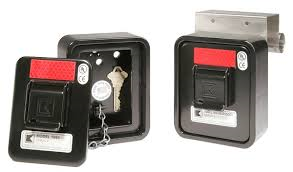 A key box is commercially made, secure steel box in which residents can place the keys to their home for rapid access by emergency crews. These boxes are then secured to the resident’s home one their keys are placed inside. These boxes can only be opened by a single key which is securely kept locked on all fire apparatus and ambulances within the Addison Fire protection District. If a resident currently using a key box from this program no longer needs it because their situation has changed, the Addison Fire Protection District will purchase the key box back from them. Should you have any questions about this program or if you are interested in participating, please do not hesitate to contact the Addison FPD Fire Prevention Bureau at 630-628-3100.